You can use strawberries, banana peel or even coconut oil to get sparkling white teeth, but try these options only after proper research, suggests an expert. Uchenna Okoye, clinical director at London Smiling Dental Group, doles out guidelines, reports femalefirst.co.uk. * Strawberries Claim: Mash up a ripe strawberry, dip your toothbrush in it and brush carefully over teeth. Within two weeks, your teeth will be whiter. Dentist’s Verdict: True. 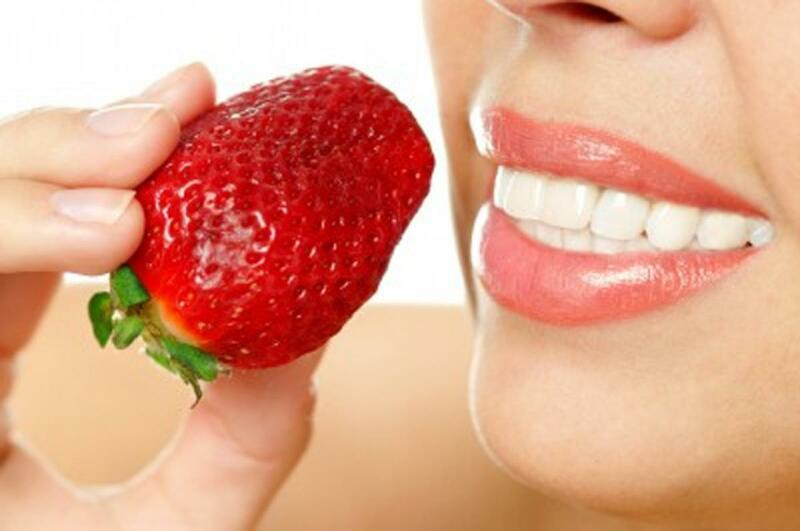 Strawberries contain citric acid, which can weaken the surface hardness of your teeth. But it also contains the more gentle malic acid, and the riper the strawberry becomes, the higher the concentration of malic acid compared to the more harmful citric acid. So choose a really ripe strawberry, rub it on your teeth and just like exfoliating the skin, it does remove superficial debris. The malic acid won’t actually break down the stain molecules, but the surface clean gives your teeth a whiter appearance. A gentle and effective natural whitener. *Turmeric powder Claim: Mix half a teaspoon of dried turmeric powder with a few drops of water and stir to create a thick paste. Dip your toothbrush in (it will be stained yellow) and clean teeth. The usual cleaning time of two to three minutes is doubled, because of the time it takes to rinse the yellow from your teeth and gums. The abrasive qualities of the bright yellow spice (derived from a root) will clean your teeth. Verdict: False. This is a recipe for disaster. The rule in dentistry is that anything that will stain a white shirt will stain your teeth. All spices stain teeth but yellow spices are the worst. Far from whitening your teeth, using turmeric will make them even more discoloured. * Banana peel Claim: High levels of potassium, magnesium and manganese in bananas can help remove stains from teeth. Simply peel a ripe banana, and rub your teeth with the insides of the peel for about two minutes. After three weeks, your teeth will have whitened. Verdict: True. If you rub the skin it can act as a gentle exfoliator and will remove some surface stains, but the banana will not reach inside the pores on the surface of your enamel - so no true ‘deep’ clean will take place. * Cider Vinegar Claim: Rinsing with apple cider vinegar (mixed two parts of water) will make teeth whiter and protect teeth and gums from bacteria. Verdict: False. Cider vinegar is a favourite of ‘detox’ devotees. Once swallowed, it mixes with pancreatic secretions in the intestines and turns alkaline, but when it hits your teeth, it is an acid, albeit a weak one. This makes the enamel on your teeth less resistant to damage - like wetting a chalk and then scraping off the surface. * Coconut oil Claim: A 3,000-year-old Ayurvedic way to clean teeth is to swish a tablespoon of oil (usually coconut, sesame or olive oil) around your mouth for 20 minutes every morning. The coconut oil sticks to the oil in the cell membranes of any bacteria in your mouth, so when you spit it out, you are ridding your mouth of unwanted micro-organisms. Used by stars including Gwyneth Paltrow, who claim it whitens teeth and improves complexion. Verdict: False. There is no scientific evidence at all that ‘oil pulling’, as it’s called, will whiten teeth, or even remove bacteria. It’s possible that the act of swishing the oil around your mouth will dislodge some bacteria or debris, so followed by a careful brushing session, your teeth may look cleaner. But no science shows that oil pulling will make your teeth any whiter.